UNIQUE Automotive Firestopper is a super-light, mechanical sleeve system engineered to protect your NASCAR driver and equipment in competition. For your wires, cables, and hoses that breach the firewall. Ideal for use in NASCAR, IMCA, and SCCA competition. Made in the USA. 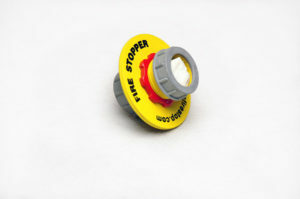 The UNIQUE Automotive Firestopper is a threaded aluminum sleeve system designed to firestop and restore the integrity of a car’s firewall when running wires, cables or hoses from the engine compartment through the firewall to the interior of the vehicle. 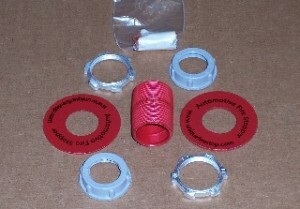 The Automotive Firestopper Sleeve System comes complete with UNIQUE Intumescent Firestop Putty for sealing the sleeve along with aluminum washers and locking couplings, plus plastic bushings. 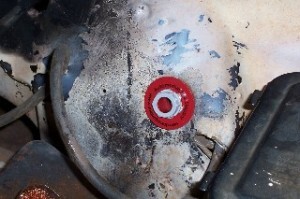 In an engine fire, the intumescent putty responds to heat and flame by expanding to fill the sleeve. The sleeve contains, controls and directs the expansion of the firestop putty, thereby sealing the firewall and offering additional protection for your driver and equipment. Available in ½, ¾, and 1 inch diameters. Designed and manufactured in the USA in our own factory. If you have questions about which size sleeve system to purchase, please call us for assistance at 251-960-5018. Ask for Mike Sr.
Firestopping Mechanical Sleeve System engineered for competition. This threaded aluminum sleeve comes complete with aluminum washers and locking couplings. 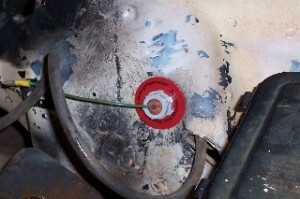 Device also includes bushings and intumescent firestop putty that responds to heat and flame by expanding. 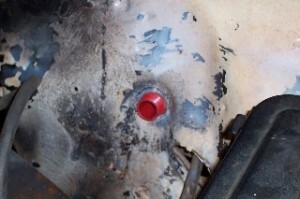 The sleeve contains, controls and holds the material in place during an engine fire. Step 1: Using one of the washers to mark your hole, drill the hole to the outside diameter of the sleeve you have selected. Step 2: Assemble one half of the sleeve system. Using the putty supplied, form a very thin (1/8″) bead of the material to be placed behind the first washer to form a tight seal behind it. Step 3: Place the first half of the system in the firewall. 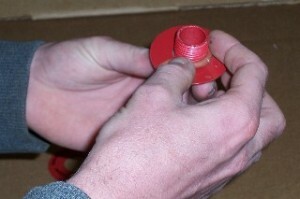 The putty should hold it in place while you assemble the other side. Step 4: Repeat step #2. 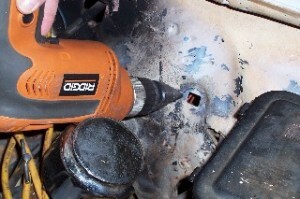 Be sure to get the system as tight as possible using a pair of channel lock pliers to tighten the lock couplings. You may need assistance to hold the opposite side. The intumescent seal behind the washers should form a seal and the system should be held firmly in place by the hardware. Step 5: Run your wires, cables or hoses to their destination. Place as much of the intumescent putty in the end of the sleeve as you can.